I spend the night drifting in and out of sleep; the headache is still with me. Eager to explore the city I jump very early and wake up the receptionist to let me out. He is not happy. It is around 7 am and he is sleeping on the lobby floor with a small fan blowing the heavy air. 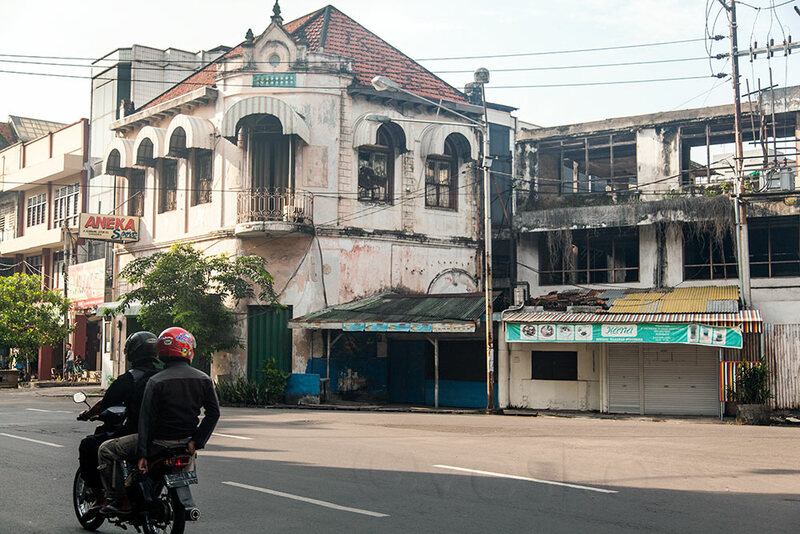 A bluebird taxi drives me to Jembatan Merah, the historical Red Bridge of the city. Despite the freeways, it takes forever to get there (for 70k). The historical Red Bridge is underwhelming. It is simply ugly and dusty. I start walking around in hope to find something interesting, but all is the same – traffic and dust. It is getting hot and I am getting tired. 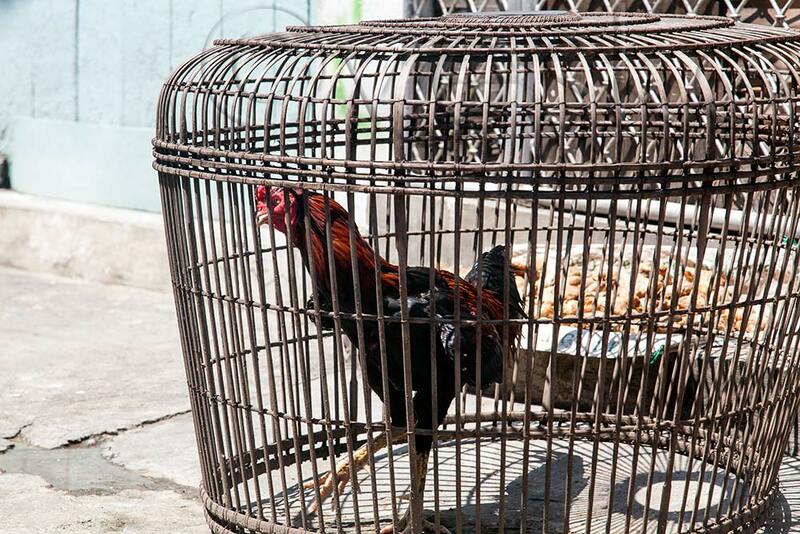 Then I see a canvased place with “Soto ayam” written on the canvas. Some people are sitting and eating there. I am suddenly very hungry and duck into the narrow space under the canvas. It is cosier than it looks from the outside. A very sympathetic old man makes chicken soups (soto ayam) for the hungry population. This must be one of the yummiest chicken soups I have eaten in a long time. With the sweet tea to counter the spiciness, it costs only 12k rupiahs (under $1.20). The Red Bridge. A few lethargic bicycle taxis try to get my business. They always sleep in the passenger seat while waiting. 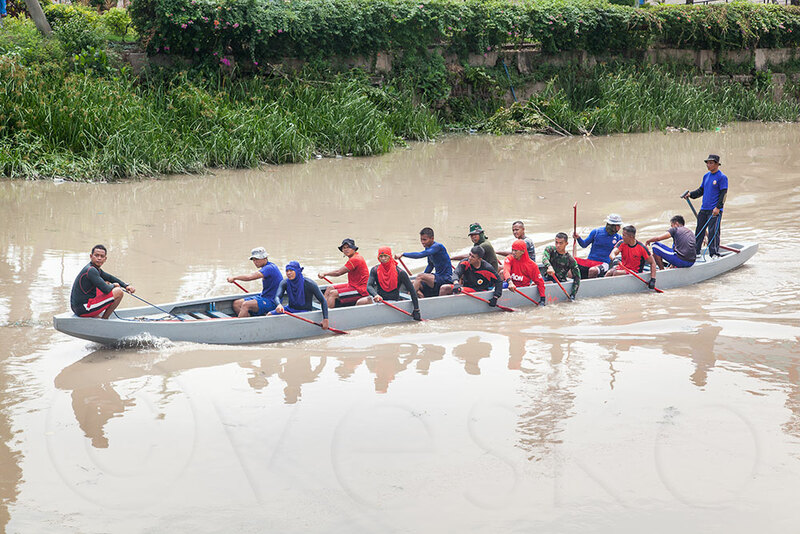 A few poor buggers are rowing under the bridge. Any physical activity for fun In this heat must be insane. Some remnants form colonial times. This must be China Town, but I couldn’t find anything Chinese. 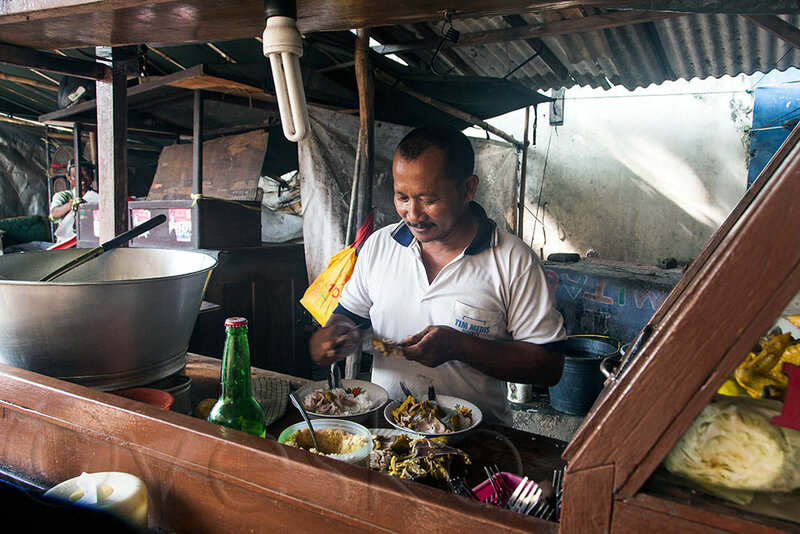 A happy vendor, specialising in chicken soup (soto ayam). 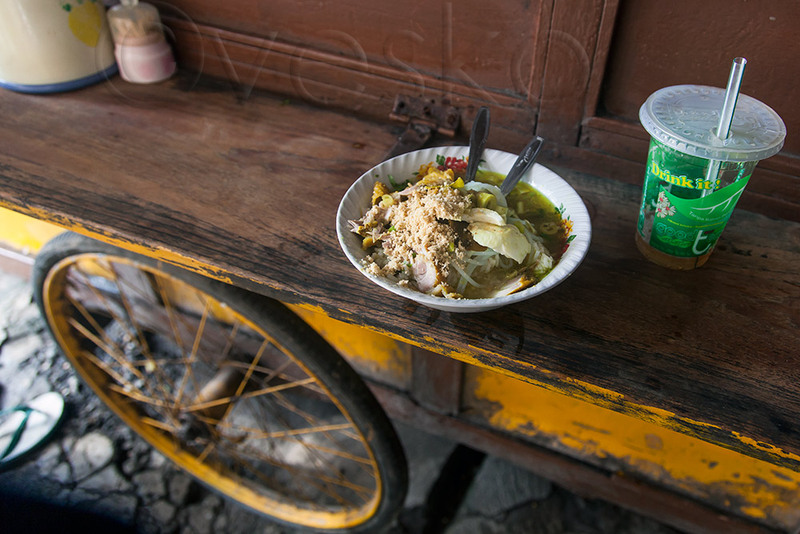 Delicious Soto Ayam for 12k. Fortified by the amazing soto ayam I continue my quest to find something interesting, but have no luck. I pass lots of bike selling/renting/parking/repair shops and a few banks. I decide at least to change a bit of money. 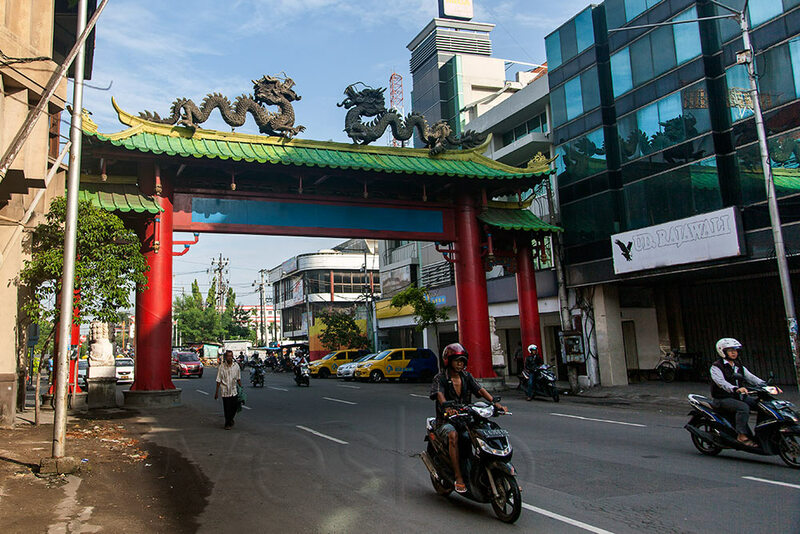 Again no luck – it appears that the banks in Indonesia don’t exchange foreign currency. A clever young man in one of the banks directs me to the official money changer. I find the place, but it opens at 10 am and it is still 9 am. 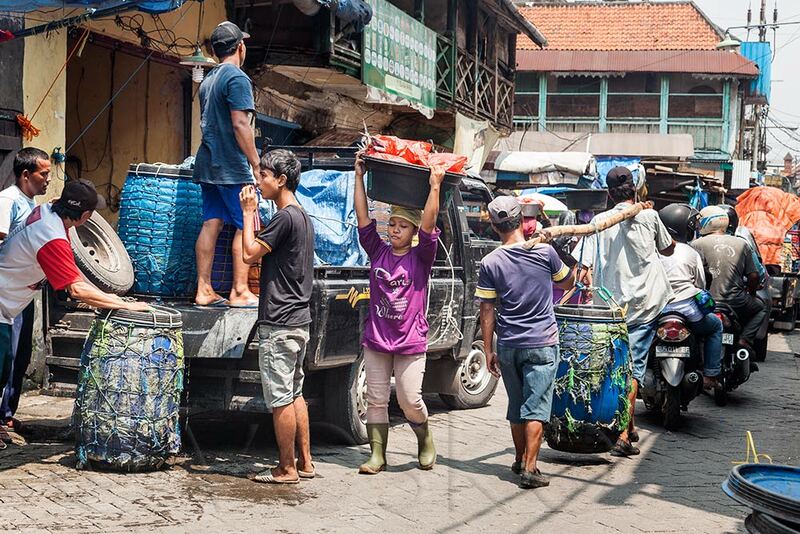 There are no convenient coffee shops around – the area is full of warehouses, trucks and noisy loading gangs. I find a shaded sitting place around the smelly canal or river (it is so polluted, you wouldn’t know). 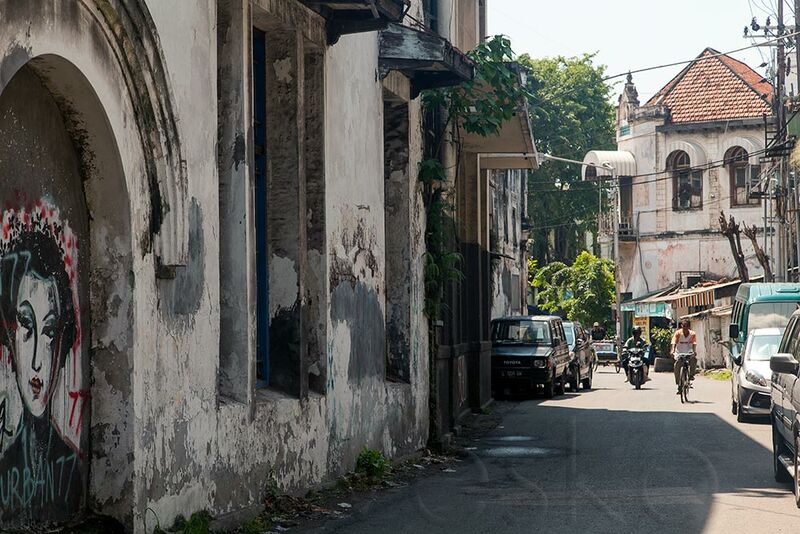 Good for me – I rest there and read the Surabaya section of Lonely Planet. 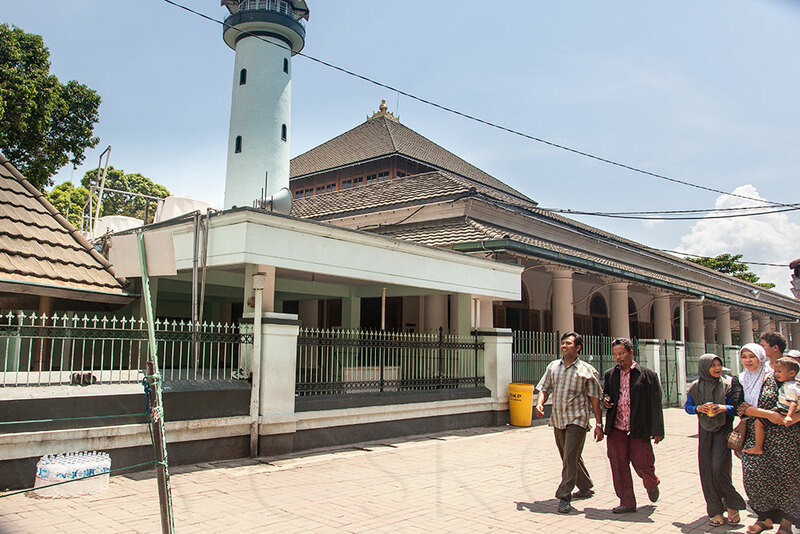 On Google map I find a few recommended places – the mosque (Mesjid Ampel), the bazar (Pasar Pabean) and the Arab quarter, all of which sound interesting. While I am reading, a guy comes to sit with me. I talk to him using the translator on my smartphone. His name is Osman and he works as a truck driver, now waiting for his truck to be loaded with metal rods. Looking for the official money changer. 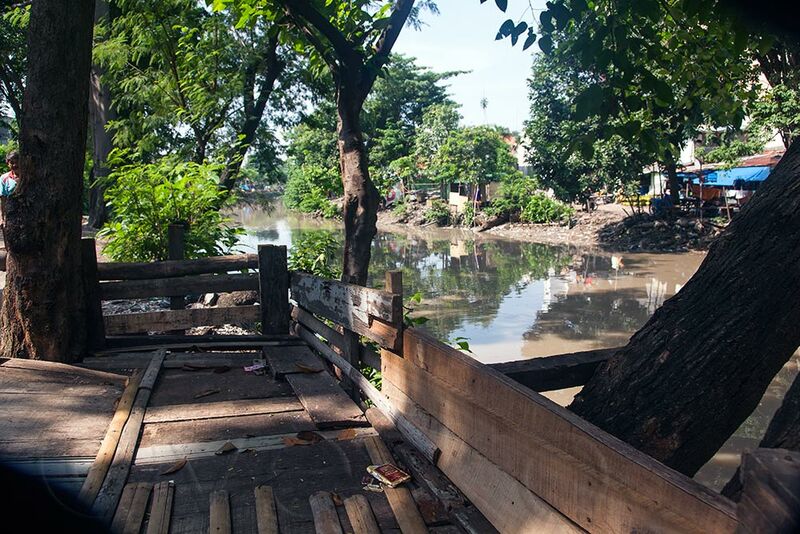 My resting place around the polluted river/canal. Some more colonial architecture, I guess. At the money changer the exchange rate is quite good (10 500r for one ozzie dollar), compared to the rate I got at the airport yesterday. 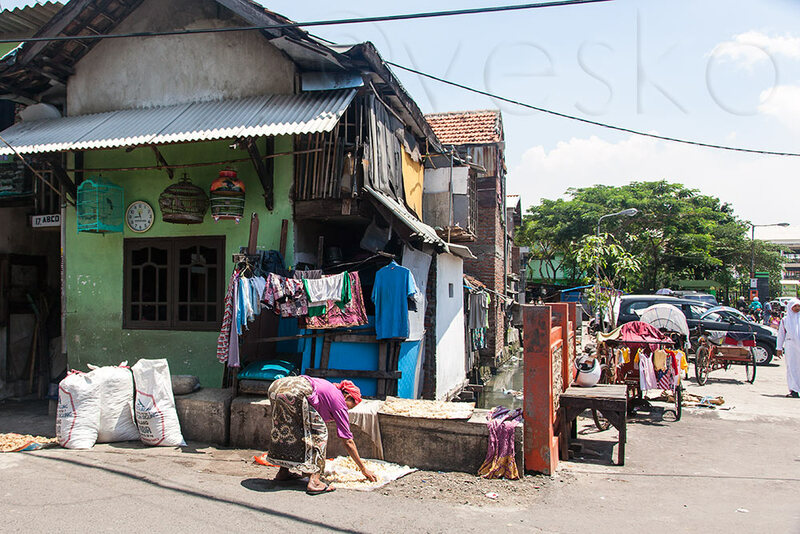 I change 200 bucks convinced that the two million rupiahs I get in return will last me until Yogyakarta (Jogja), which is probably a mistake, but for now I am so happy and so full of new energy that I jump enthusiastically to find the bazar, despite the oppressive heat. I find the bazar easily or rather the bazar finds me. To escape the scorching sun, I push myself into one of the numerous shaded alleys, leading out of the main road and enter a different world. It is very quiet here and the sheer amount of goods crammed in such a narrow space is overwhelming. There are not many customers and the vendors seem dazed by some kind of lethargy. Most of them are napping at their stalls; electrical fans blowing hot air to ease their labours. I walk around this maize and soon the shoes, the trinkets and the clothes are replaced by onions, potatoes, meats and seafood. I stop to watch a couple of dudes operating an ancient looking grinding machine. The machine hisses dangerously, one of the blokes loads onion, garlic and chilly at the top, the other collects the hot paste, pouring down the bottom. O-o, the aroma, the spiciness of it! It is so strong, I can’t stop sneezing and coughing. How do they survive it all day long? 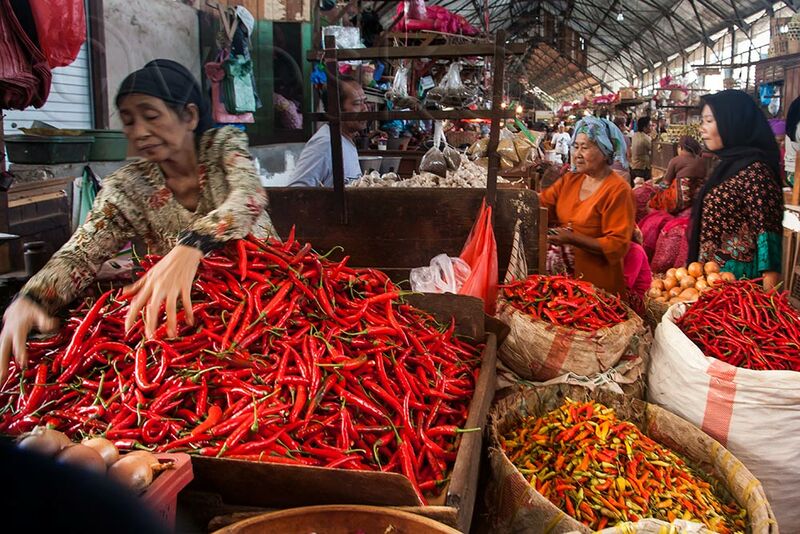 Hot Chilli in abundance at Pasar Pabean. 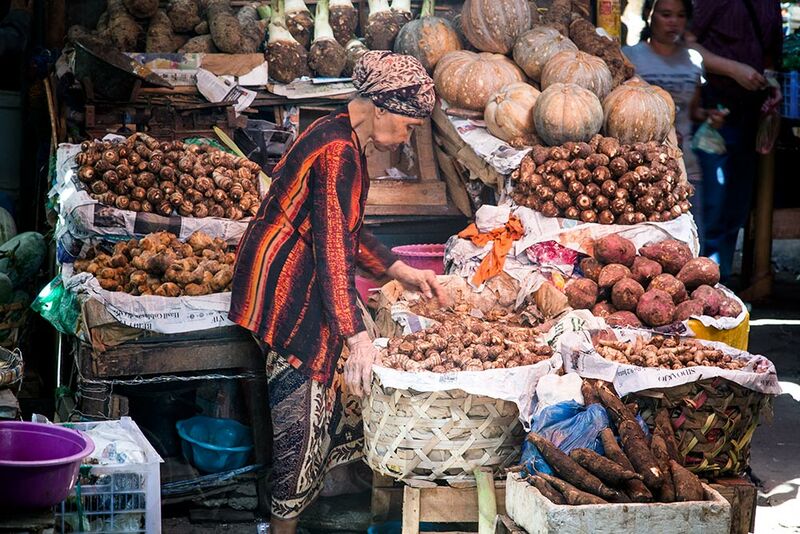 A grandma selling potatoes and other earth produce at Pasar Pabean. 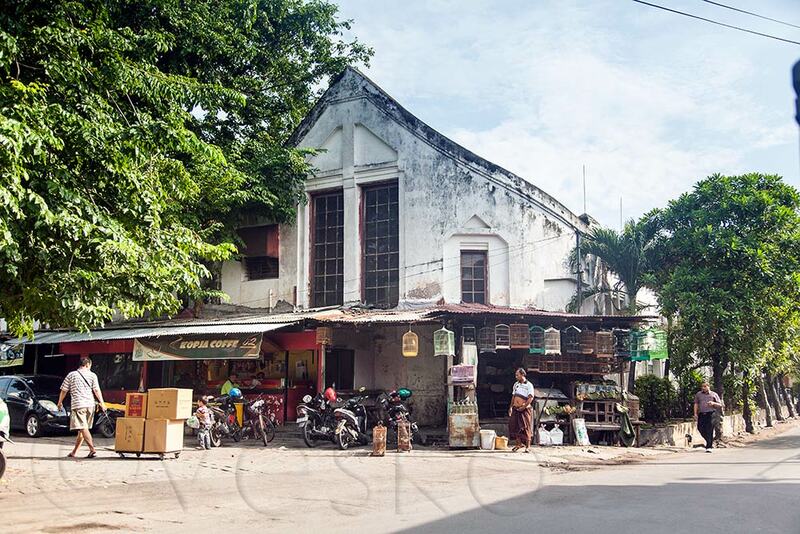 Lonely planet recommends Mesjid Ampel as a must see attraction in Surabaya, but when I get there I am not that enthusiastic by the look of it and have no desire to enter. At this hot moment I cannot imagine going through the ordeal of putting on the appropriate attire (there is a guy at the entrance, pointing at my shorts and pointing to a bench piled with sarongs). Instead I sit for a while next to a tout, who gives up selling me whatever he is selling pretty quickly and then we both enjoy the quietness of the moment. For some reason i don’t feel like entering Mesjid Ampel. The Arab Quarter is bustling with activities. I am happy with my wandering around the Arab quarter; the narrow, twisting lanes are full of small colourful houses, skinny grandmas meeting chubby children returning from school and little shops selling strange things. Inevitably, after all this walking, I become very hungry. 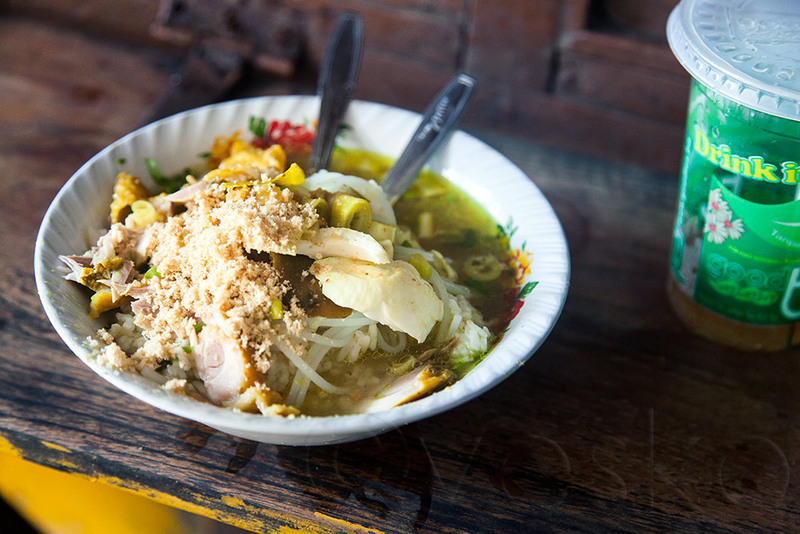 There is no problem, the area is full of street vendors, offering different foods, but one dish is always prominent – Soto ayam, the chicken soup that I liked so much in the morning. That’s my choice again. Satisfied with my day in Surabaya, I catch a bluebird taxi back to my hotel. The taxi guy is so nice, that I ask him to take me to the airport in the morning for my flight to Semarang. Tomorrow I will travel to Semarang and then on to Wonosobo to see the Dieng Plateau.